The Fan Craze game card sets are designated as either WG-2 or WG-3. The WG-2 designates the American league deck of cards that have a blue back. WG-3 is the National League deck. The NL cards have a red back. Once upon a time, there was a thought that the 2 decks were issued separately and at different times. As the above ad shows, the 2 decks were issued at the same time, and you could order 1 or the other. It is interesting to note the ad mentions the player images are halftone pictures. This just means the images are made up of small black dots of different sizes. The larger the dot, the darker the image. This is the type of printing we see on other pre-war cards like M101-4/5 Sporting News, and 1928 Fro-Joy. A type of halftone is still used on cards today, but there are 4 colors instead of just black. And today’s cards are digital halftone printing. Halftone printing in newspapers was still a relatively new process when these cards were printed. Widespread use of the technology began only the decade before these cards. The cool thing about these cards is that they fill a gap in card issues. 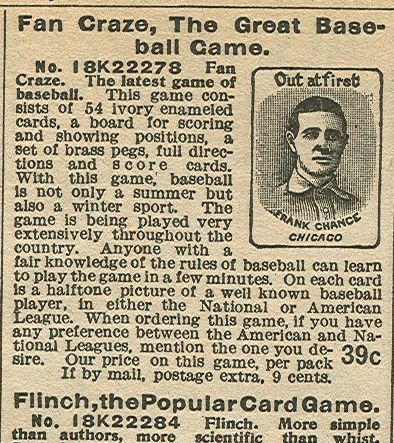 There was not much in the way of baseball cards between the 1895 N300 Mayos and the 1909 T206 cards. This means there are some first appearances to be found. There are also plenty of cool images to be found. 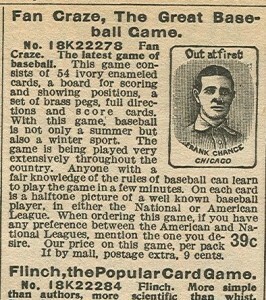 The Fan Craze company obviously used images taken by the Horner Studio. The Eddie Plank and Honus Wagner, for example, have the same image as found on their T206 cards. Now if I only had $0.39, and a time machine.